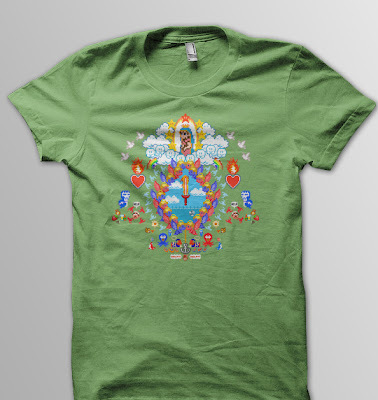 The Gay Gamer: Who wouldn't want to be seen wearing an 8-bit-ified 'Virgin de Guadalupe' t-shirt? Who wouldn't want to be seen wearing an 8-bit-ified 'Virgin de Guadalupe' t-shirt? I, for one, would strut around town as proudly as a peacock if I owned the t-shirt bearing the design seen below (and here)--which was produced by one of my favorite gaming-inspired artists, Ashley Anderson. Of course, I could acquire one of said shirts pretty easily if I made my way over to fallenarrows.com and handed over $28 of my hard-earned cash. I may do just that in the next few days, to tell you the truth, as I really like how Anderson's sprite-based illustration looks against a sage-y green American Apparel tee. Do you think it would clash too much if I paired the shirt above with this "Black Honey" pin that Anne Lee (of the Chic Pixel blog and The Nichiest Podcast Ever) recently turned me on to? Yellow + green go well together. Personally, I've been eyeing one of the Hyperdimension Neptunia Neptune shirts over at NIS America's online store, but I've not yet gathered the stones to make a purchase., even though I love the series (or rather, the 2nd and 3rd games... The first was pretty bad). Yellow and green go pretty well together. Personally, I've been eyeing the Hyperdimension Neptunia shirt that's over on the NIS America online store, but I've not yet gathered the stones to make a purchase... Despite my love for the 2nd and 3rd games in the series. This shirt is pretty awesome too, though, so I may end up having to buy two shirts in my ever-expanding collection of awesome gaming-themed apparel. Ah, thanks for the support, Espiga :) Also, I just realized that the pin I mentioned in this post could go well with my messenger bag. So, maybe I should buy it and the shirt soon--and maybe another gaming shirt I've had my eye on for some time. I hope you make your purchases, too--and then let me know about them, of course! This is really great! Perfect color and the design is one I've always loved. BTW, Espiga, I've never played any of the Hyperdimension Neptunia games, although I've always thought they looked/sounded interesting. Sounds like I should start with the second if I ever decide to jump on board, though, eh? You ... you don't wear so many t-shirts? That amazes me, for some reason. I practically live in t-shirts and jeans. Then again, I work from home as a freelancer. And I'm a guy. Anyway, glad to hear you recently bought two game-related shirts. Which games inspired them? I've got this Mario-themed one: http://www.threadless.com/product/543/This_Is_Not_a_Pipe and a neat FFIX-inspired tee that I'm regretting just a bit because it's brown and... I don't really like wearing brown! As for my lukewarm feelings about t-shirts, I guess I just like wearing things that I think look better on me? T-shirts always make me feel a bit "frumpy," for lack of a better word. Not that there's anything wrong with other people wearing t-shirts! That's just how I feel I look in them. I also wear a lot of skirts and haven't been able to find a lot of ways to wear regular t-shirts with them in a way I find flattering, haha. But I really like the colors on this one... I'm pretty tempted! Also, your brown FFIX shirt sounds right up my alley, as I love both FF and brown clothing. I understand not loving t-shirts, especially if you're a girl. You ladies have so many more options than we guys do! Oh really, you covered it already?! That must've been before I started following you, or I just missed it! Oh, yeah, it was long ago. I think it may have been in my first year -- so all the way back in 2007!